Vinh Hoan Corp.[Industry news] Pangasius raw material prices cool down, but relief expected to be short-lived - Vinh Hoan Corp. Greater raw material availability has seen Vietnamese pangasius prices ease slightly in the past couple of weeks, though Undercurrent News sources remain skeptical as to how long this will last. Posting on Linkedin, Alban Caratis — aquaculture manager with consultancy Fresh Studio — noted Vietnam was now into its key breeding season, which he said should reduce pressure on processors and farm-gate prices. This peak season tends to cause prices to ease around the same time each year; in 2017 they slipped from VND 29,000 per kilogram to VND 22,000 between May and July, and in 2016 they eased to VND 18,000/kg, he said. 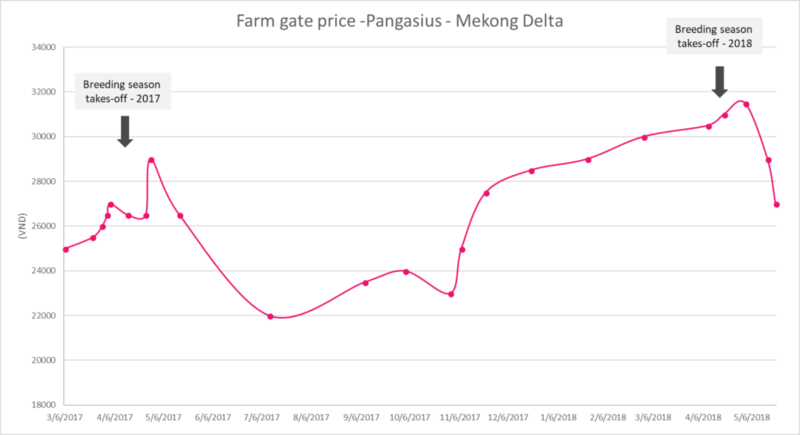 In 2018 farm-gate prices have reached what is thought to be historic highs of over VND 30,000/kg, and apparently peaking briefly at VND 37,000/kg. The recent easing has seen a slight dip in prices of fillets shipped to Europe, it seems. Standard treated 100% net weight, freight on board, shipped out of Ho Chi Minh has fallen from as high as $3.35 per kilogram to now fluctuate between $2.95 and $3.30, one importer told Undercurrent. A trader based in Vietnam said prices remained at the higher end of this scale, $3.30/kg or even more. Premium, untreated fillets have sold this year at between $4.25/kg and as much as $4.50/kg, sources have said. The Dutch importer estimated these prices were now at $4.20/kg, while a key Vietnamese producer estimated these prices were actually at $3.80-$4.00/kg now (these were to both Europe and China, so prices given may be before delivery). In the US market, Don Kelley — vice president of US importer Western Edge Seafood — told Undercurrent prices were around $3.30; a full dollar higher than in January of this year. The market in the US is still short of product, he added, and while there has been some progress on backlogs caused by the new US Department of Agriculture inspection regime, “not enough to make a difference yet”. Bob Noster — senior director of sales and procurement for shrimp and pangasius with Seattle Shrimp & Seafood Co — said prices had stabilized around $3.10-$3.20 ex-freezer, with noted shortages on 7/9 ounce fillets. “The raw material improved in May compared to April, with the current price of raw material at VND 31,000-31,500/kg, he said. Packers are committed to contracts for shipments to the US in the latter part of 2018 at higher costs than at present, so Noster does not expect to see any significant weakness in prices for the balance of 2018, he said. The fingerling situation has also improved in volume and prices have gradually softened, he agreed, “but due to farmers’ large losses in past years they are hesitant to re-stock ponds with too much fingerling”. Noster said improvements in US inspections were marked, “and the turnaround time from port to passage is much quicker than several months ago”. Regarding the cycle of raw material prices rising only to fall at the same time each year, both the Vietnamese producer and the European importer believe there will be greater stability this year. “The situation is improving now because the price of fingerlings dropped by 50%,” the importer said. A shortage of breeding fish, and so fingerlings, prompted the rise in prices back in fall 2017. “That means that farmers were able again to buy new fingerlings. But results and better availability will only be there at the end of the year or early next year — a [production] cycle is six-seven months,” he said. The executive with a producer and processor echoed this, suggesting prices should be more stable in 2018 than they were the prior year. Raw material prices, in this firm’s experience, have also mainly dipped on extra large sizes, “which are not very widely marketable, hence we do not use much for processing”. The main sizes for processing remain strong in price.